Spring in the Miami Valley always brings electrical storms. Lightning from these thunderstorms commonly causes damaging power surges in our homes. Power surges can harm nearly any electrical device in your home, and we frequently find air conditioners ruined during lightning storms. 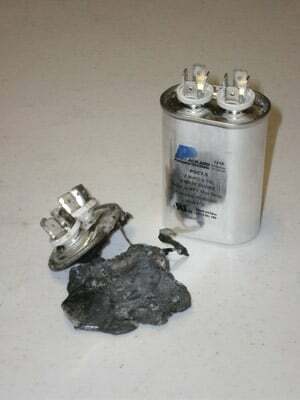 Damage from surges can range from blown fuses and burnt capacitors to fried compressors and burnt wires. Many customers want us to find conclusive proof that lightning caused the damage. Most insurance policies will cover the damage if a power surge can be proven. Sometimes the best evidence of a lightning strike is other damaged electronics. Stereos, TVs, and other electronics seem to be more sensitive to power surges than your air conditioner. So, if you find that the day after a thunder storm, both your air conditioner and your DVD player are out, your home has likely been hit with a power surge. A weak surge can damage an air conditioner’s capacitor (inexpensive) which, if not replaced, will take out the compressor (very expensive) week or months later. For this reason, it’s important to have a tech check your HVAC system if you have any other damaged devices and suspect a power surge. What can you do to prevent a/c compressor damage? Turn off your air conditioner at the thermostat during a lightning storm. Your air conditioner is only susceptible to power surges when the unit is operating. Of course a direct lightning strike can still turn your a/c into a pile of smoking scrap metal, but direct strikes are very rare. For all but direct lightning strikes, we install a surge protector designed specifically for your air conditioner. Contact our 24 hour service department for details. In the Cincinnati area, Duke Energy offers Strike-Stop, a whole-house surge protector to protect your belongings from most power surges. They also offer inexpensive insurance if the surge is too much for Strike-Stop to handle. As always, feel free to contact us if you have more questions or need a service technician.